Hypothes.is is a free, open source annotation app that aims to build a peer review layer for the internet. Hypothesis allows you to annotate (adding notes giving explanation or comment) or highlight content on texts across the internet. This allows you to individually or collaboratively research openly online. This research and discussion might take on multiple forms. An individual researching a given topic and leaving a trail of digital bread crumbs (their annotations and highlights), as opposed to just bookmarking websites. Hypothesis will allow you to search across and share these openly online. A class examining and exploring a series of online texts (websites, blogs, wikis) to aid in comprehension and synthesis. Hypothesis allows for a common tag to organize readings across a group. 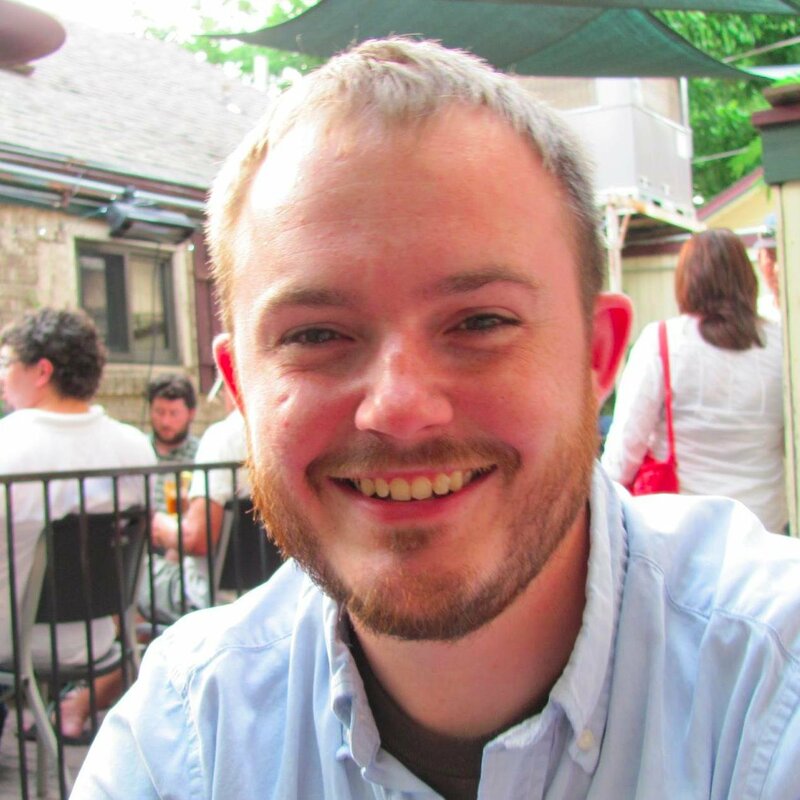 A research group focusing analysis and discussion of a topic focusing on the text used across digital texts. Hypothesis is open source and allows for public annotations and responses baked into the source materials. Follow the guidance I’ve included below to get started…or click on this link for a video walkthrough. The first thing you’ll need to do is create an account to use hypothes.is. You have several options for using hypothes.is in your work. I use the Chrome extension to allow me to annotate/highlight pages as I read online. If you do not want to use Chrome, or the extension, you can still use Hypothesis by prefixing the URL of the webpage you want to annotate with https://via.hypothes.is/. This means that you’re copy/pasting the text above immediately in front of the page you want to annotate. 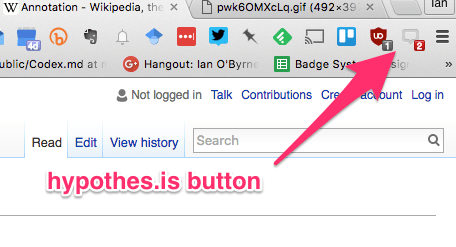 When you install the Chrome extension, it will add a button to the top of your browser window. 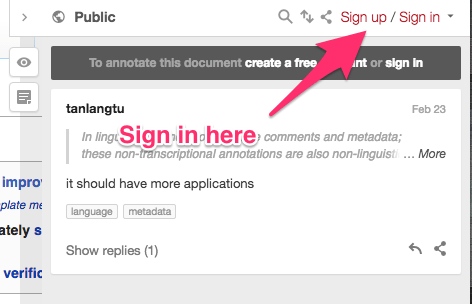 The number on the button indicates the number of public annotations already available for a given page. Click on the button and you’ll see Hypothesis load on the right side of your page. Click the arrow pointing to the right to access the tools. If you haven’t already, you might need to sign in using your Hypothesis account to annotate and save your work. When you open up the app, you’ll immediately have several options to add your social layer to the internet. Use the user icon to sign out, modify my account settings, or review my public annotations. 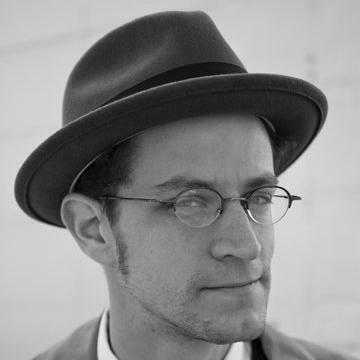 My public annotations are also available at https://hypothes.is/stream?q=user:wiobyrne. To go directly to your annotations stream substitute my username (wiobyrne) for the username you created. Click the share icon to share the page and automatically add the prefix I shared earlier to allow others to use hypothes.is with you. 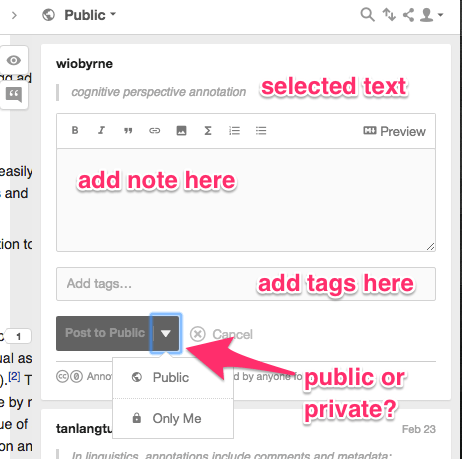 Click the “Public” link to view and create annotations publicly online…or create your own private group. A private group is helpful to protect students or your information. Click the icon that looks like an eye to hide/reveal highlights and annotations from others on the page. Use the icon that looks like a document to create a note for the entire page, as opposed to individual sections, lines or words. 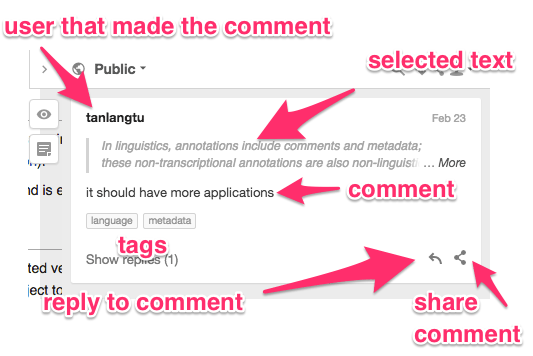 From this point you can also review comments already public on the page. You’ll be surprised at what is already out there online. In the graphic below I review the information contained in one note found on a webpage using Hypothesis. In the middle of the note, in italics, you’ll find the text they annotated or highlighted from the original source. On the top left of the next, in bold, you’ll find the name of the user that created the note. You can click on their name to see their public stream of notes in hypothes.is. Under the selected text, you’ll find the comment made by the user about the selected text. Beneath the comment are the tags used to identify the note. Tags are helpful ways to connect your notes with your community. You can click on the tag to see what others are sharing on that topic. In the bottom right corner you’ll find an icon that allows you to reply to the note and another icon to share this note. Sharing is a powerful way to tweet, share, or cite this individual note from the website. To begin to add your own ideas to the webpage, you start by reviewing the notes already left behind by others. To leave a new note, go in to the webpage and select text from the page. When you select the text two buttons will pop up immediately beneath the selected content. Highlight will highlight the text, and leave a note in the panel to the far right indicating that you marked up the text. 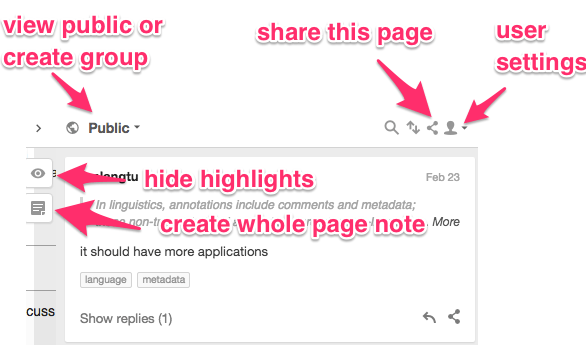 Annotate will create a note and allow you to leave a note, links, tags, etc. You’ll see the text you selected and have space to leave a note. The formatting and options for leaving your note are super powerful. You can embed links, images, and take advantage of markdown if needed/desired. Finally, you can decide to share this note publicly, or save it privately for yourself. Please do not forget to add tags. Tags are like categories or themes for the text, or note you’re leaving. You can have multiple tags for each note, so don’t feel restricted. I use tags to identify research topics or groups that might be interested in that specific content. Hopefully by this point you’ve got a good idea of how to get hypothes.is up and running in your web browser. Now it is your opportunity to get involved in the discussion and create a social layer of annotation on the web as you research online. If needed, you can review the video walkthrough I created for this tool. You might also want to review the quick start guide and the annotation tips for students provided by Hypothesis. 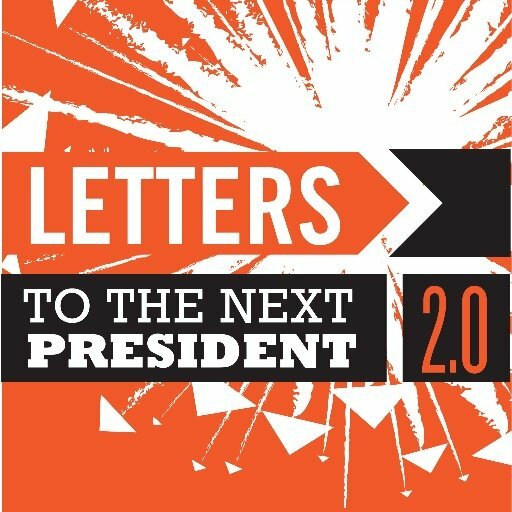 If you like content like this, you should sign up for my newsletter to stay on top of weekly events in literacy, technology, & education. Initiative for 21st Century Literacies Research shared your post. 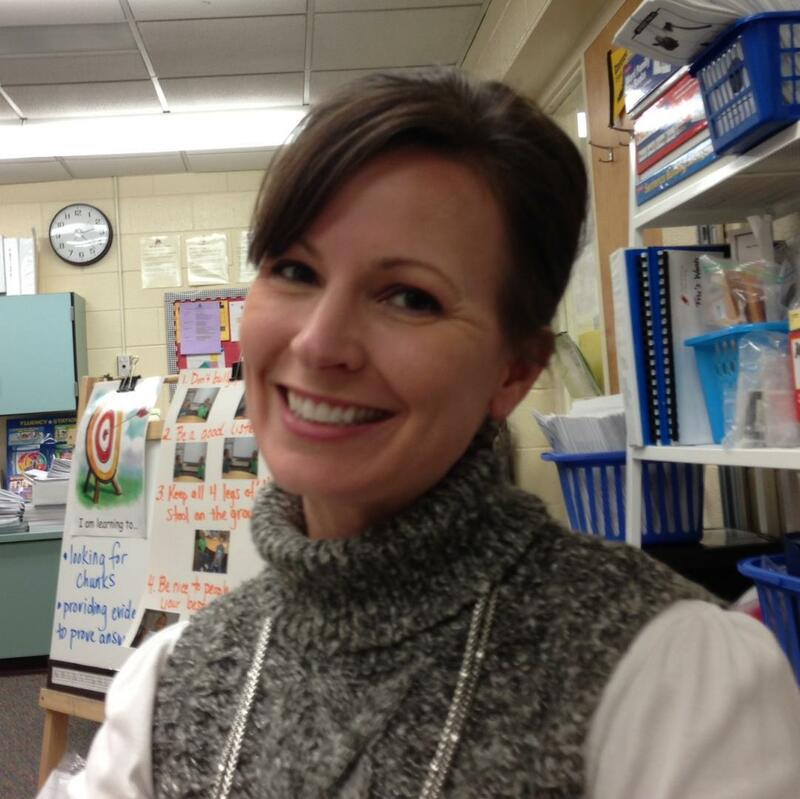 Literacy Resources shared a link.